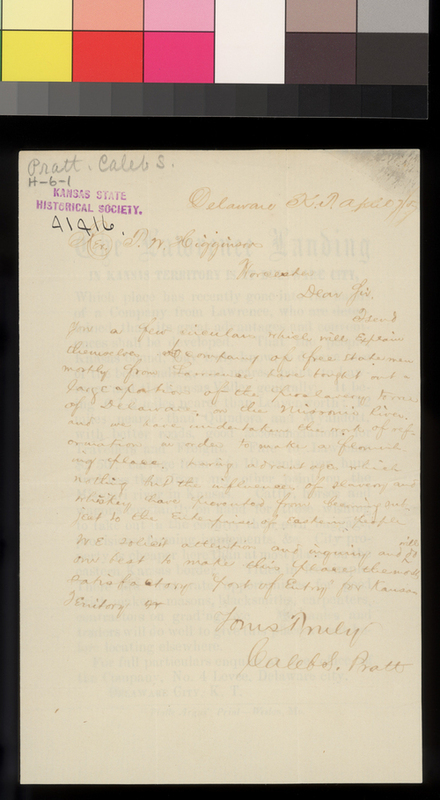 Caleb Pratt writes from Delaware, Kansas Territory, to Reverend Thomas W. Higginson, a prominent Northern abolitionist and an agent of the Massachusetts Kansas Aid Committee. He informs Higginson that a company of free state men had bought out a large portion of the predominantly pro-slavery town of Delaware, Kansas Territory. They intend to make it a suitable place for the entry of free state emigrants. Collections - Manuscript - Higginson, Thomas W.